A look at the OSI model and how it can help you make sense of the Internet of Things (IoT), its communication protocols, IT (information technology), OT (operational technology), M2M standards, and the technologies needed to unlock the value of IoT. If you are lost when people talk about IoT, AI, VR, Quantum computing, etc.…. well guess what…. You are not alone… There are hundreds, if not thousands of different technologies in the Internet of Things. They use a wide range of different standard, protocols and buses. How do you make sense of it all and overcome the inevitable interoperability issues? Like all subjects, when you want to master the subject, you need to begin to understand what framework is being used and use it as a guide to build up your expertise. That’s where the OSI model plays. It’s a framework to understand IoT. 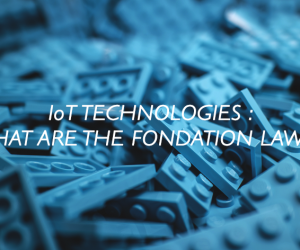 As standards are essential and no IoT project or building project is the same, it’s important to understand the foundations of the IoT to solve this interoperability challenge. This is where the OSI model and its nephew, the TCP/IP model, come in. 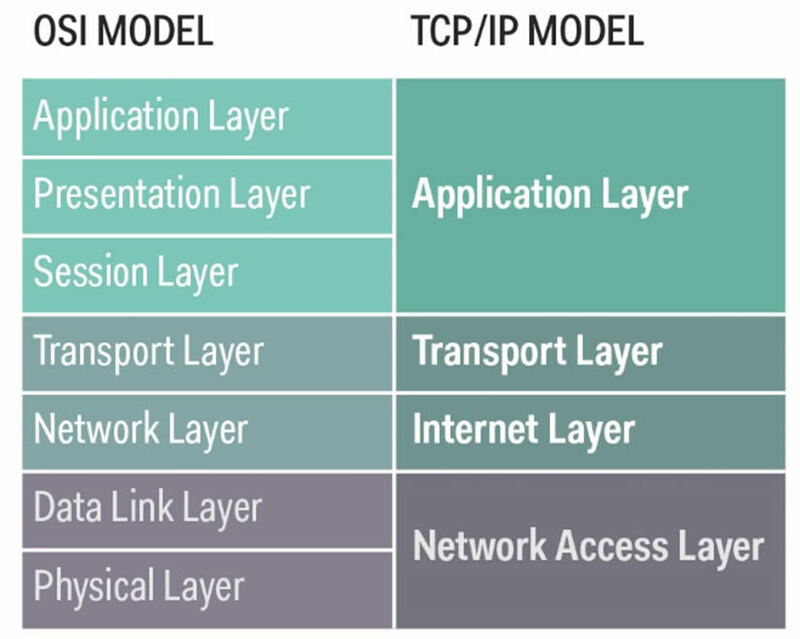 While the TCP/IP model has four so-called layers, the OSI model, short for Open Systems Interconnection model was designed in the 1970s as a methodology to describe data communications using seven layers in the structuring technique the OSI reference model is. The OSI network model makes it easier to implement a communication by separating it into these seven layers – and thus it helps in understanding IoT communications and related standards as well. The seven layers of the OSI network model form a logically composed ordered set of subsystems. 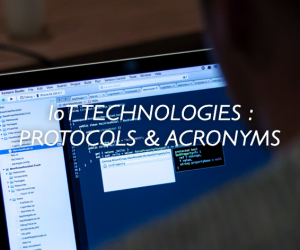 As I cover several components of an IoT solution and IoT communication technologies in a series of blog posts (e.g. LPWAN or wireless low-power, wide-area networks; IoT platforms etc.) and often refer to the (layers of the) OSI model, here is a break-down of the seven layers. We start with the top layer that matters most from an IoT business perspective. Layer 7, the application layer, represents the processes on the level of applications and users. In the scope of IoT it’s where the link with the business application and the end user is the closest, enabling access to network services. In this layer we find messaging protocols such as CoAP, MQTT, XMPP, AMPQP and HTTP. Layer 6, the presentation layer, translates data in a form that can be used by the application. As it formats and encrypts data for communication it essentially solves compatibility issues in the communication between the application and the network. An example is the Transport Layer Security (TLS) series of cryptographic protocols. Layer 5: the session layer, is where the connections between local and remote applications are initiated, managed and terminated. It enables to establish network sessions between processes on several network stations (computers, etc.). Layer 4, the transport layer, is about host-to-host data transport or transmission. Essentially, the transport layer ensures that data transfers between hosts are completed, which among others includes error recovery. TCP and UDP are two examples of protocols in the transport layer (more below). The next 3 layers of the OSI model are the layers I will refer to the most when speaking about the mentioned low-power, wide-area networks (LPWAN) such as LoRa and LoRaWAN, Sigfox, Ingenu and cellular LPWA technologies such as LTE-M and NB-IoT. Layer 3, the network layer, is the layer of routing technologies to transfer data packets between different nodes across various networks. In this third layer of the OSI model is the second part of TCP/IP: IP, the Internet Protocol. And in the context of IoT that includes IPv4 and, most importantly, IPv6, which is part of a wider IoT architecture including complementary standards. Layer 2, the data-link layer is the OSI layer where data transfer between two directly connected nodes in a network takes place. In the IEEE 802 standards, such as Ethernet, the data link layer is divided into two sub layers: the medium access control layer (MAC layer) and the logical link control layer (LLC). Various IEEE 802 standards are essential for IoT communications in this layer (e.g. IEEE 802.15.4 or low rate Wireless PAN, as among others used by other specifications such as ZigBee, ISA100.11a and Thread). Layer 1, the physical layer, finally, is the layer that is still very present in the way many of us still speak about the IoT. This is where the things sit, how the networks are organized and where the raw data originates and needs to be communicated. The physical layer forms the foundation of IoT and its connected devices, which from an OSI physical layer data communications perspective, is about moving from ‘sensed’ raw data to encoded data and transmitting them at and from the edge of the network. It’s the layer that includes the essential physical structure needed to make the IoT possible: from cables and radio frequency links to essential transmission specifications, network topologies and the communication protocols and hardware on a device and data level. This way the OSI model becomes a way to tackle the interoperability issues in IoT and to cover the various ways and protocols used in doing so and the different layers in an IoT solution and project. That is where and why the OSI model plays a role in IoT: up from devices to business applications with communication standards playing on all the levels of an IoT deployment. 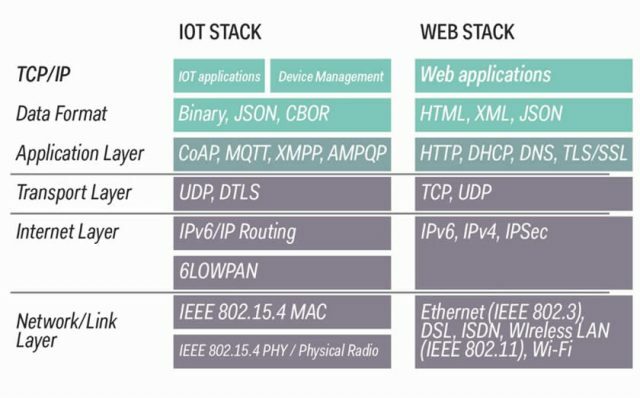 In my IoT book Digitize or Die I zoom in on the various protocols, the OSI model, TCP/IP and the various aspects the IoT stack and web stack with some of the protocols mentioned in the graphic above. Do note that the different buses, standards and protocols differ, depending on the types of use cases and applications. In building management, for example, you will encounter typical technologies in the context of IT and OT integration and of IIoT (Industrial IoT).